A year or so ago, a friend of mine purchased a home in the Des Moines area. When I first visited his home, my first reaction was that it was just run down. The carpets looked worn. The cabinets looked very beat-up. The appliances looked straight out of the 1970s. The main floor was liveable, but the basement and upstairs looked fairly gutted, as though the previous owners had just used the spaces for storage and nothing else. It didn’t present itself well and because of that my friend got a great deal on the house. He paid a very low amount given the house’s location and access to nearby services. However, with some time and labor over the next few years, the house is going to slowly turn into a gem. In fact, it’s improving with each visit. He’s replacing carpets. He’s installing drywall. He’s doing landscaping. Bit by bit, this seemingly ramshackle house is turning into something beautiful. And valuable. Does he already know how to do this stuff? No, not really. He just has a big handful of do-it-yourself books and a pretty nice set of tools out in the garage. He also knows that if he messes something up, it’s not a big deal. He can just re-do it. Of course, he’s not tackling anything that’s too frightening. If he messes up installing a carpet, it’s not a big deal. 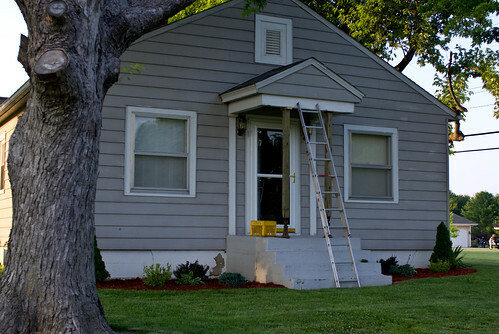 If he messes up alterations on the foundation, that could cause major problems. Thus, he’s avoiding things that could cause permanent expensive damage to the home itself. That’s far outside what he feels confident doing. There are a lot of benefits from this approach. First, he has an ongoing project to fill up his spare time. There isn’t a bored evening for him. There’s always a piece of drywall to put up, a carpet to install, a piece of landscaping to work on. He has tasks aplenty to fill his time. Second, he’s drastically increasing the value of his home at little cost. He’s not really investing a lot of money into what he’s doing, but the value of his home is going up significantly. He’ll likely be able to sell the home for more than double his purchase price, but he will have put very little money into the situation. Finally, most of the stuff he’s doing does not affect his living space. His plan is to finish the basement, turn that into living quarters for a while as he finishes the main floor, and then return to the main floor as his primary living quarters while he works on the upstairs. No matter what, he’ll have space for guests and plenty of room for his own living needs. This is an enormous success for my friend. You can do the same thing if you’re shopping for a home. Just have a little courage when it comes to home improvement tasks and be willing to accept a mess in parts of your home for a while and you can end up paying a low price for what will become a very nice home.